One of my favourite things about TCAF is discovering new cartoonists, and that's what happened when I happened upon Jonathan Dalton's table. Dalton has been in the game for a while, making comics in British Columbia, but this was the first I'd heard of him. 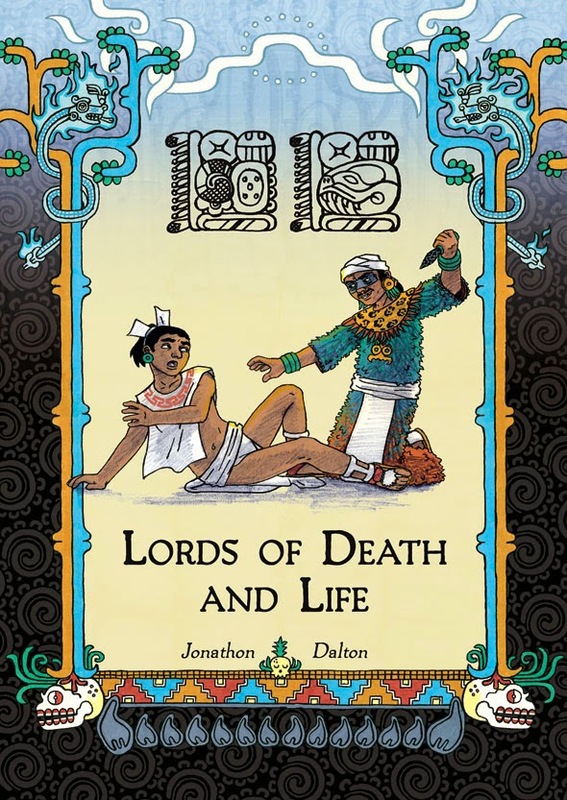 The cover to his Lords of Death and Life jumped out at me, as I love historical comics, especially when they are set in time periods that don't get a lot of play usually. This story takes place in pre-Contact Central America, and is both a political and supernatural thriller. Mol Kupul lives a quiet life in a small village, but his dreams send him to the city of Xicalango, where he becomes a pawn in the growing unrest between the city's Maian and Aztec populations. It seems that Mol has gained some superhuman abilities, and people from both cultures, trying to sow unrest, want him to work for their cause. Dalton's story is clearly very well-researched and alive with tons of little details about the time period, as well as strong character development. Dalton's art reminds me a little of Phillip Bond, and is as detailed as the story. I'm really glad I picked this little book up, and would recommend it to anyone who enjoyed Sam Humphries's book Sacrifice.